Charlotte Schreiber or as she is better known in Wales, Lady Charlotte Guest, was one of the most prolific ceramic collectors of the nineteenth century. Together with her second husband, Charles Schreiber, she acquired pottery and porcelain in Britain and on many tours in continental Europe. In her later years, as a widow, she undertook the task of cataloguing her vast collections eventually bequeathed to the Victoria and Albert Museum and the British Museum. Charlotte Schreiber kept journals throughout her life. The original manuscripts are held in the National Library of Wales but edited versions were published by her son after her death. They form one of the most vivid accounts of the pleasures and delights of collecting. 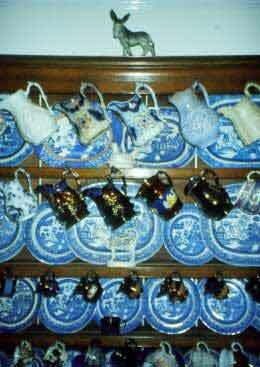 Women have long been associated with collecting china but in the nineteenth century the mass production of ceramics, both functional and ornamental, offered even the lower classes the possibility of using ceramics as house decoration. 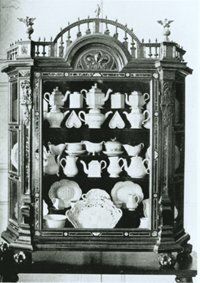 The Welsh dresser and its display is a prime example. It is a repository of family memories and a space for women's creative and aesthetic activity.It has also become a symbolic image of national identity.